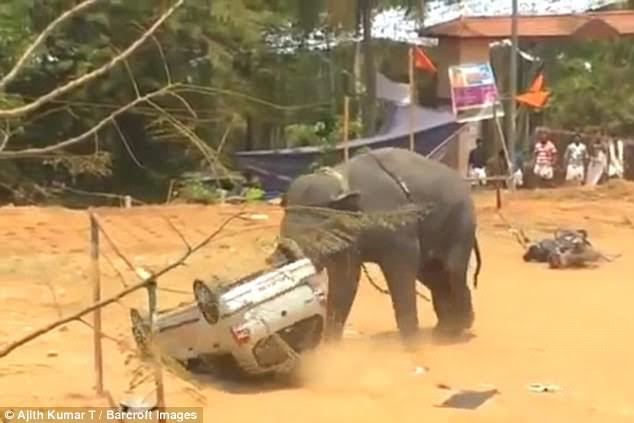 A dramatic video shows an angry elephant acting out its frustration by overturning a car with its trunk. 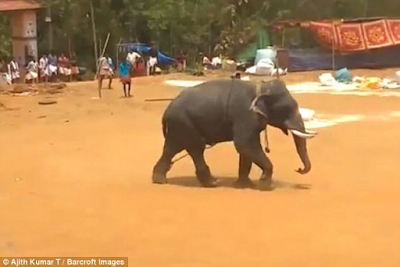 The aggressive elephant disrupted a local festival called Ambalapura that was taking place in Thrissur, Kerela in Southern India and went on a rampage, destroying things. The elephant was appearing at the festival with its owner but during the celebration, the owner lost control of the elephant. The weather was hot and the crowd at the festival were noisy, as is expected at such big ceremonies, and it is believed these may have factored in getting the animal upset. In the video, the animal can be seen towering over the car, before lifting it with its trunk and sending it tumbling across the ground. It also did the same with the motorcycles parked close by. Frightened villagers fled the scene and luckily, no one was hurt.